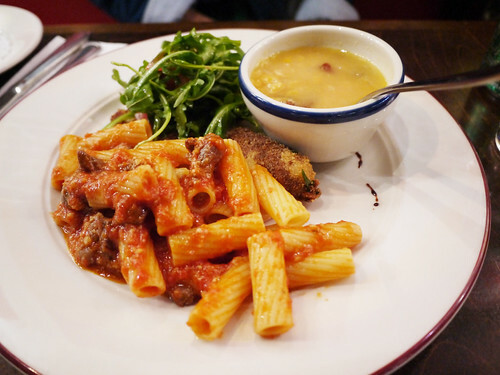 In brief: In which I try something new at Via Emilia. Of all the myriad Italian pasta restaurants in the neighborhood, I often end up at Via Emilia for a hot plate of bolognese ragu which is why I failed to notice the $13.50 lunch special which consists of this plate that you see and four different little tastes. It's a little like a Japanese bento lunch box without the box part. If you like a little variety in your lunching palette, do try. $13.50 is such a reasonable amount for a change of pace.